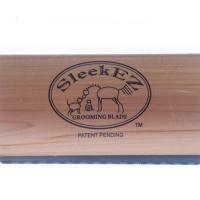 SleekEZ the original American curry comb to suit the horse's coat, perfect for the season change. Effectively removes all the dead hair and winter undercoat. Wooden handle and metal serrated blade that removes the excess hair, it does not tear or ruin the coat. Use with care, following the direction of hair growth. Size 25 cm. Also excellent to remove the dead hair from rugs, saddlecloth, saddle pad and other equipment.